Jet Set Willy is a computer game originally written by Matthew Smith for the ZX Spectrum home computer. It was published in 1984 by Software Projects and ported to most home computers of the time. A tired Miner Willy has to tidy up all the items left around his house after a huge party. With this done his housekeeper Maria will allow him access to his bedroom. Willy's mansion was bought with the wealth obtained from his adventures in Manic Miner but much of it remains unexplored and it appears to be full of strange creatures, possibly a result of the previous (missing) owner's experiments. Willy must explore the enormous mansion and its grounds (including a beach and a yacht) to fully tidy up the house so he can get some much-needed sleep. Jet Set Willy is a flip-screen platform game in which the player moves the protagonist, Willy, from room to room in his mansion collecting objects. The game is an early example of a nonlinear title since, unlike the screen-by-screen style of its prequel, the player can explore the mansion at will. Willy is controlled using only left, right and jump. He can climb stairs by walking into them (jumping through them to avoid them) and climb swinging ropes by pushing left or right depending on what direction the rope is swinging. The play area itself consists of 61 screens making up the mansion and its grounds and contains hazards (static killer objects), guardians (killer monsters which move along predetermined paths), various platforms and collectable objects. The collectable items glow to distinguish them from other objects in the room. Willy loses a life if he touches an enemy or falls too far, and he is returned to the point at which he entered the room. 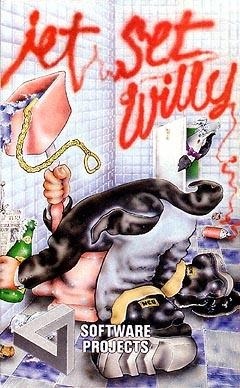 This may lead to a game-ending situation in which Willy repeatedly falls from a height, losing all lives in succession. Music on the Spectrum version was Beethoven's Moonlight Sonata for the menu, and If I Were a Rich Man during the game itself. Reviewing Jet Set Willy for Your Spectrum magazine in June 1984, Sue Denham wrote that the game was "every bit as good and refreshing as the original". The game was number one in the UK Spectrum sales chart for several months, until it was replaced by Sabre Wulf. The ZX Spectrum version was voted the 6th best game of all time in a special issue of Your Sinclair magazine in 2004. The game was included on the 1985 compilation They Sold a Million, along with Beach-Head, Daley Thompson's Decathlon and Sabre Wulf. As originally released, the game could not be completed due to several bugs. Although actually four completely unrelated issues, they became known collectively as "The Attic Bug". After the player entered the room The Attic, various rooms would undergo corruption on all subsequent game plays, including all monsters disappearing from The Chapel, and other screens triggering instant death. This was caused by an error in the path of an arrow in The Attic, resulting in the sprite travelling past the end of the Spectrum's video memory and overwriting crucial game data instead. This bears similarities to a buffer overflow, and as such is an early example of such an error — and the problems it can cause. Initially Software Projects attempted to pass this bug off as an intentional feature to make the game more difficult, claiming that the rooms in question were filled with poison gas. However, they later rescinded this claim and issued a set of POKEs to correct the flaws. Other bugs included a case where an item under The Conservatory Roof was placed too close to both the screen entrance and a killer object making it impossible to collect. The Software Projects fix removed the killer object. There was also an invisible and impossible to reach item in First Landing. The Software Projects fix relocated the item to The Hall — although some fixes relocated the object to The Bathroom where it became visible as another tap item, by poking value 33, instead of 11. The Banyan Tree was impassable in an upward direction — the Software Projects fix changed the status of an essential block from solid to passable.